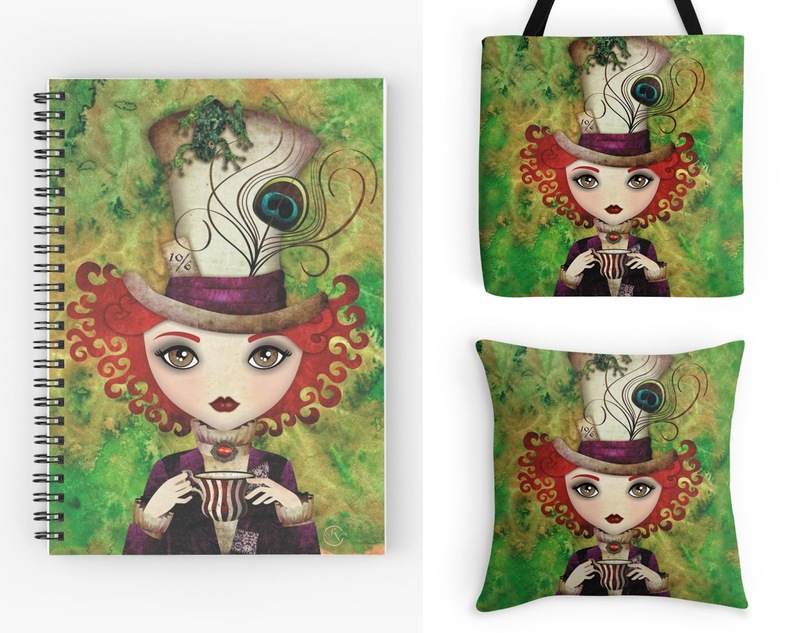 Enter this giveaway for a chance to win a gorgeous Lady Hatter notebook, pillow and tote bag set designed by Sandygrafik. Good luck! I love the Chesire Cat!! I think I love him cause he cause he is so mischievous and also he is a cat, and cats are my fav!! Cheshire Cat for me. Who doesn't love a grinning cat that can vanish into thin air and pop out of nowhere? The Cheshire Cat!! Love the grin and how philosophical he is!! Cheshire Cat had me from meow! The Cheshire cat and Alice ! I love the Cheshire Cat, because of is philosophical side. Hatter for me too because he is awesome! I like how naive Alice is and the madness of the Mad Hatter. Cheshire, he comes off as creepy and sweet at the same time. Alice. because she is the main character. My favourite character is Alice because she is so curious. Lovely giveaway, the mad hatter is very cool too. My favorite is Cheshire Cat. I love how edgy he is. Sorry i mixed up with the tweet option and the share option . I love the craziness of the mad hatter! I like Alice because she is a brave girl. The Cheshire Cat. He's got attitude. My favorite character is Alice, because she is so curious and imaginative. The White Knight. He's such a melancholy sort. Absolem, because why not? Also, because he questions. I like Alice's sister. She thinks her sibling has gone "off the deep end", but accepts her anyway. My favorites are equal between the Mad Hatter and the Chesire Cat. They're both funny and cool looking. My favorite is Alice because is a sweet adventurous girl. The White Rabbit is cute, but his obsession with running late and fretting put him somewhere between endearing and agitating. I love the Cheshire Cat. Cheesy and sinister all at once. Cheshire Cat for its contribution to the atmosphere. And I love ❤️ cats. Cheshire Cat because I like cats. My favorite character is Hatter he is the most bubbly jolly attitude an love his spontaneous clothing!! I really love Alice ... she goes on so many adventures and has wonderful wonderland friends! Thanks for the chance to win--the Lady Hatter design is gorgeous! I like Alice best because she's kind and courteous to others. Hatter is my favorite because he is just so eccentric and fun. Alice is my favorite because she's been my favorite since I was a little girl! Alice is Alice and she is wonderful, but I also love the Mad Hatter, because his insanity is so... Sane! Mad Hatter, you can not not laught with him. The Mad Hatter. I am partial to a bit of quirk! The Cheshire Cat. The smile. Mad Hatter. I've always loved how 'mad' he is! Who's your favorite Alice in Wonderland character and why? I like the cheshire cat. I think I like him the best because he smiles and gives advice and disappears. I love the Mad Hatter because he is just so out there. I love the made hatter and my nieces really loves all things Alices in Wonderland if win would give to her maybe so cute would have trouble giving it away. I like the Cheshire Cat the best because he's the coolest.